as narrated by Onigegewura, posted by Infotainment and Education. It was enough that Abioro – one of the biggest men in the music industry at the time – was ready to promote him. They brought documents for Sunny and his band boys to sign. They called it a contract. It could have been called any other name for all that KSA cared. Won ni ko wa je saara, o ni ojo ti wonu ju. Se ata ni won ni ko mu wa ni, abi iyo. You are invited to a free feast, you are complaining about the short notice, are they asking you to bring salt or pepper? Sunny Ade and his boys didn’t hesitate. It is doubtful if any of them read what the contract said. The most important thing was that they were going to become recording artistes. Sunny signed. His band boys signed. Everybody was happy. That was when Sunny decided to ask Chief Abioro for a raise of the royalty payment. The chairman listened patiently to KSA and his colleagues. He was nodding as they canvassed one reason after another why a raise was in order. When they finished, Chief Abioro flipped open a file he had on his table. He brought out a bundle of documents. Even from where he was seated across the table, Sunny saw that it was a copy of the contract he signed. “An agreement is an agreement. It is a binding contract!” The chief informed them. “This is what you signed. This is what you are entitled to! No more, No less.” He returned the documents to the file. Case dismissed. Chief did not only dismiss the request for a raise. He opened another file on his table and brought out a new set of documents. Your guess is right! A new five-year contract! By now, Sunny Ade had learnt enough law. He had become a professional mathematician. He had obtained his Master of Business Administration from practical experience. He knew the implication of putting pen to paper. He applied for an adjournment. Baba Ibeji was composing fresh materials at home when the court bailiffs arrived. They served him with an order of interim injunction! The court order was as comprehensive as it was broad. Sunny Ade was prohibited from sale, distribution, marketing, dealing, etc. etc. of the record. He read the order again. Even without being a lawyer, he knew the implication of the document he was holding. With palpable emotion, his mind went back to how he came to Lagos from Abeokuta with only one shilling and eighteen pence! He remembered his years with Baba Sala. He recalled how he got stranded with Baba Sala’s travelling theatre in Jebba and Kano. How he did not see his mother for two years whilst he suffered to make it as a musician. It was not the Sunday Adeniyi that knelt down to pray that stood up. He had become empowered. He had become emboldened. That same evening, he established his own label. Gani did not forget to raise the issue of how 20kobo became 15 kobo. He also cross-examined Chief Abioro at length on the onerous terms contained in the contract. Gani put it to the chief that the contract was in restraint of trade and that it was therefore null and void as it amounted to colonization of King Sunny Ade, a free citizen of the Federal Republic of Nigeria and a citizen of the Commonwealth! In His Lordship’s judgment, Justice Dosunmu held that although some of the terms of the contract were stringent, that was not a ground for holding the contract invalid. In effect, the contract between ASL and KSA was therefore valid. As the court pronounced on the validity of the contract, Sunny looked at his lawyer. Gani signaled to him to be calm, the court had only resolved one issue out of four. The court having found that the contract was still subsisting, KSA was ordered not to release another album pending the expiration of the contract with Chief Abioro’s company, which was due in six months. Six months! What am I going to be eating? Sunny thought. Apparently, this was the only part of the judgment that Anti Wura, Buroda Alani’s third wife must have heard, and heard wrongly too! As if reading Sunny Ade’s mind, Justice Dosunmu said he realized that Sunny Ade would need to eat and feed his family in the six months that the contract had to run. 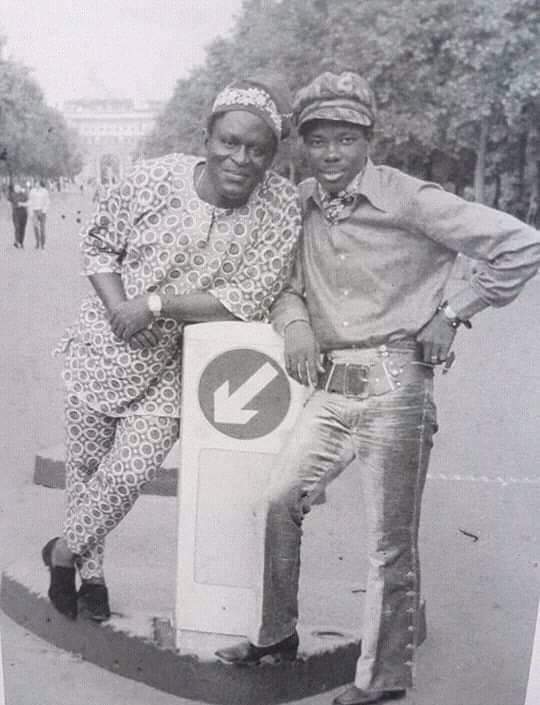 His Lordship therefore held that the injunction was limited to only recording of albums and that Sunny Ade was free to do live performances for fees. His Lordship said that this was in order to avoid a situation where the King of Music would starve or be compelled to go back to Chief Abioro. Historian Is Not a Judge.